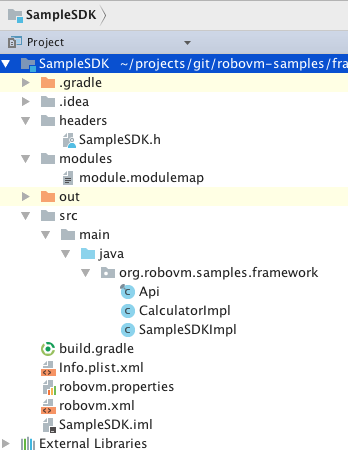 There was a framework target in MobiVM/RoboVM for a while. But there was no any integration with Idea IDE and there was no template project available till PR253. 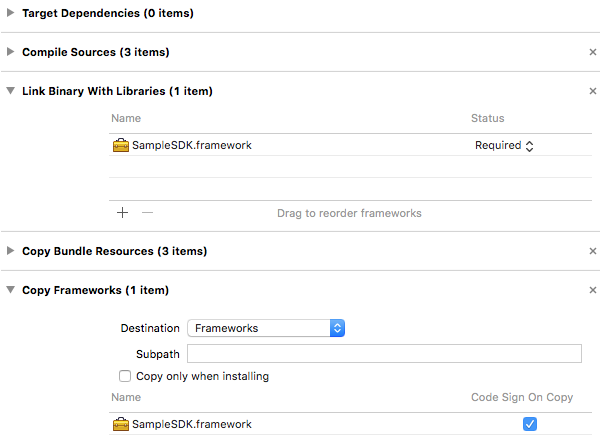 Also this PR introduces framework support library binary that simplifies Framework development as all native code that is required to initialize VM is embedded into this library. First one demonstrate how to get some “hello world” by manipulating Java VM native interface. It is bunch of code normal user of third party framework usually prefer not to know: Each single java api call has to be wrapped into a dozen lines of code. It provides framework header and defines AMCounter and AMAnswerMeSDK objc classes. * implementations are in the AMTopicImpl and AMIconImpl classes in Java. * doesn't have proper abstract classes. Comments say to think about these classes as abstract but real purpose of these classes is just to satisfy link phase. These classes are never used as it is, instead completely different class instances are created, for example AMAnswerMeSDKImpl is created and then ‘casted’ to AMAnswerMeSDK. IMPORTANT: do not name methods that create Java object with name that begins with “alloc”, “new”, “copy”, or “mutableCopy” otherwise you end up with EXC_BAD_ACCESS. Name newCalculator really bad. Read this post for reasons and possible workaround to if name has to start with new. // MyFramework of framework. it is entry point to framework. Source code is available at my robo-samples github repository. headers/SampleSDK.h - header file that will be copied to Headers folder of framework. It is already filled with ObjectiveC symbols that correspond to API defined. Once there is any change to API happens this header shall be updated to allow ObjectiveC/Swift applications to see it. This file is being copied through Resource rule in robovm.xml. modules/module.modulemap - contains module definition of framework to allow it to be used with Swift. In general there is nothing to change in this file. This file is being copied through Resource rule in robovm.xml. At this point Framework project from template already contains basic code that allow to start using it.